1). Types: reactor, tank reactor, solid particle bed reactor, tower reactor, jet reactor and other atypical reactor. pot, steamed ball, gas furnace. zinc, cobalt etc and their alloy materials. 4). Pressure: low-pressure, medium-pressure and high-pressure. 5). Temperature: low-temperature, medium-temperature high-temperature. flammable,highly toxic, highly corrosive medium. food, pesticide, rubber, aerospace, marine, dye, new power equipment and so on. 9).Our advantages: reliable quality,codial service and great price. (A) The boiler body guarantee is one years , for accessories two years. (B) During the guarantee period , if the main body defective or broken without wrongoperating , Honor must replace the parts for free or prepare the spare-parts for free. (C) We should provide boiler technical service and operation guidance for whole life long. (E)About FAQ,We have professional technical consultants who can serve you online anytime. You can leave a message on our company's website,or submit a problem by email.We will solute your problem within one working day after receiving your information. Jiangsu Olymspan Thermal Energy Equipment Co., Ltd was established in 1988. It locates in Wujin District, Changzhou City and it's an ecological environmentally-friendly company. 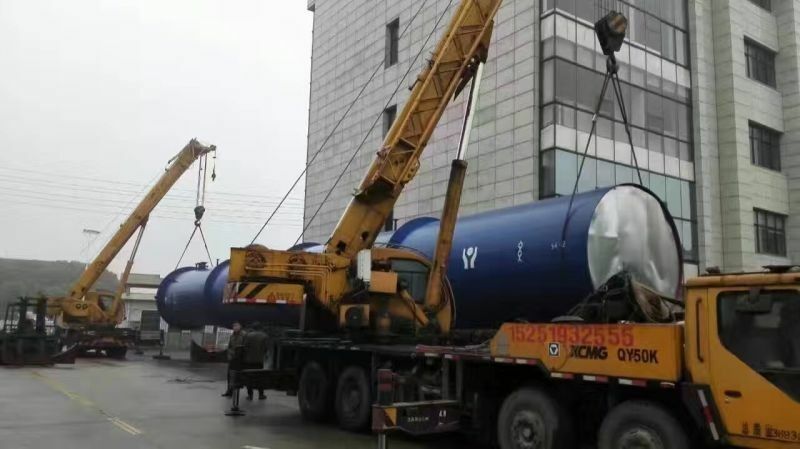 We are a leading manufacturer of boilers, pressure vessels and environmentally-friendly equipment, and also being the first and the only one to join WRO (World Renderers Organization). 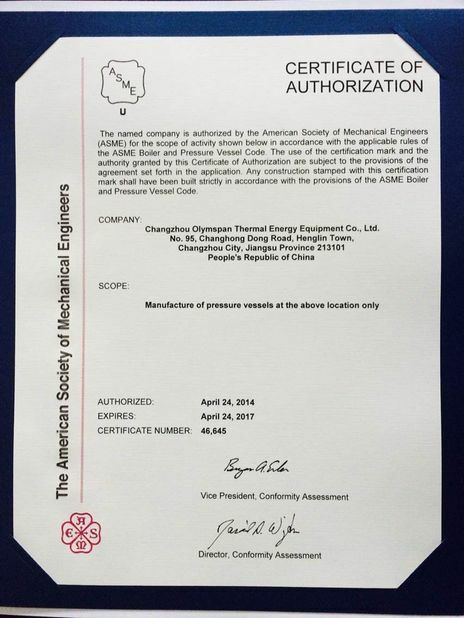 Our company possesses Manufacturing License for Class B Boiler, Manufacturing License for Class A2 Pressure Vessels, Manufacturing License for Class A Boiler Components, and the ASME “U””S” Stamp. 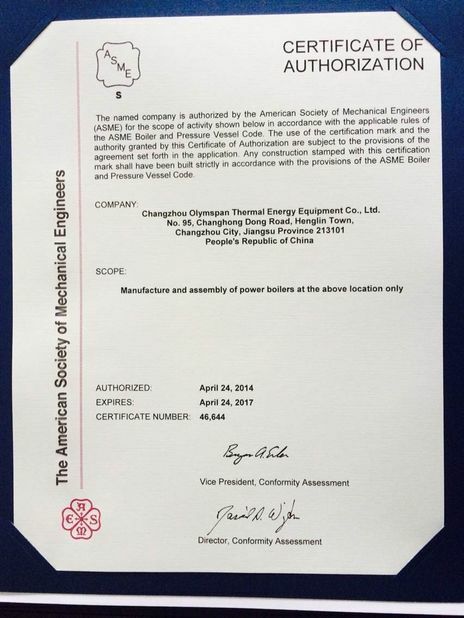 We’ve got CE certificate (EU), CRN certificate (Canada), and have passed the ISO9001 international quality system certificate authorized by CCS. Our company has more than 70 patents authorized by PRC and experienced teams, whose members are from Fudan Business Management College and from boiler and relative industries, for relative technical development and project management. We’ve won the reputation of high-tech corporation, important corporation of provincial projects and technologies research center, provincial private-owned science & technology enterprise, provincial medium-sized science & technology enterprise, and also the credible enterprise. The company not only pays attention to internal research and development work, but also keeps close technical cooperation with many scientific research institutions, such as Shanghai Industrial Boiler Research Institute, Chinese Academy of Sciences, Hohai University and Changzhou University. We keep communicating with overseas relevant industry experts for a long time and we introduce foreign advanced technology and transform it to make it be suitable for local markets. 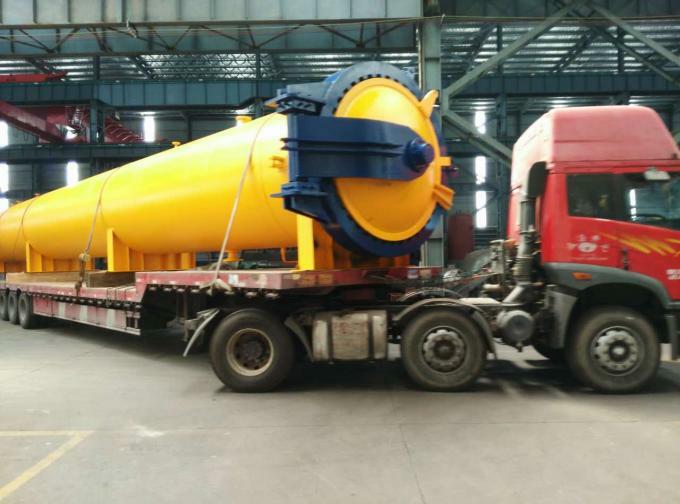 At present, our main products are boiler, pressure vessel, Hygienic rendering treatment products and so on. We have offices in Salt Lake City, Melbourne, Surat and Karachi. Our products have been exported to Canada, Russia, Australia, America, Sweden, New Zealands, Serbia, Iran, India, Pakistan, Chile, Indonesia, Thailand, Vietnam and other foreign countries.